The TNDV mobile unit has been refurbished to add facilities to this mid-sized truck. The newest addition to Nashville-based mobile production company TNDV: Television’s fleet of nine full-service mobile video units, packs full-sized production truck capabilities into a more agile, compact 40-foot vehicle. The 40-foot truck that can maneuver in the most space-challenged venues, has been redesigned and upgraded to support live multi-camera workflows, with up to three outputs for live sports and entertainment. Before joining TNDV’s fleet, the truck, originally known as Blackjack, had crossed the continent over the years as it changed hands between three different owners: ProShow in Vancouver, Greystone Media in Portland, and finally TNDV. Upon acquiring the truck, TNDV moved Blackjack to Atlanta, where it was stationed outside the Philips Arena (now State Farm Arena) for four years. As a part of the TNDV fleet, the truck was used to produce all Atlanta Hawks’ home basketball games. TNDV upgraded and rebranded the medium-sized truck after fulfilling its service at the arena. Now called Destination, the truck is built to integrate with TNDV’s remaining eight video and audio trucks. The name also recognizes the truck’s long journey to its final home in Nashville. The production control area in the truck. The width has been increased from 9 to 11.5 feet. With expanding sides that increase the truck’s width from 9 to 11.5 feet, Destination’s unique interior includes a main video area, an audio suite, and an isolated video production area that allows producers and editors to work on content without disrupting live shows. 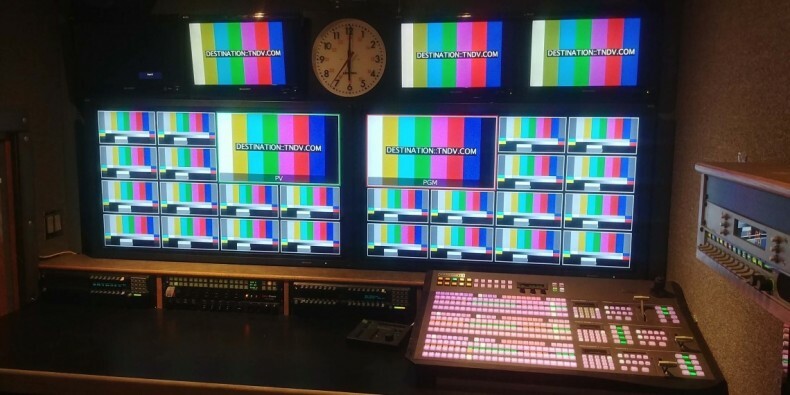 In the main production space, a Ross Carbonite 3 M/E production switcher—capable of supporting a live multi-camera workflow—faces a large multiviewer monitor wall. The truck also offers an array of high-end digital video effects (DVEs) and live broadcast graphics options, including two Ross xPression dual-channel CG systems, and either a Chyron Duet Hyper X3 or Pinnacle Deko 3000 dual-channel live graphics system. Programs can be recorded onto a bank of AJA KiPro recorders, and optionally, either Sony 1800 HDCam or Panasonic AJ-HD1200A VTRs. An EVS 6-channel HD XT slo-mo system provides an added benefit for live sports production. For acquisition, Destination carries a complement of Hitachi SK-HD1200 portable HD studio/field production cameras which, with their three 2.3-megapixel ultra-advanced CCDs, produce a high dynamic range (HDR) 1080p picture with low noise. The truck’s audio suite features a Soundcraft Si Impact 32 fader digital audio mixer with a Soundcraft MADI stagebox. Video and multiviewer routing are handled by a large Platinum router from Imagine Communications.